Triethylene Glycol Rosinate comes with low odor, non-toxic, soluble in many types of solvent, Compatible well with some polymeride such as CR, SBR, EVA, PVC, Acrylic etc. Triethylene Glycol Rosinate is a type of liquid form rosin made with stabilizing treatment, the molecular weight distribution is narrow, comes with some polar radical. Soluble in petroleum, aromatic, ester, ketone and other types of solvent. Compatible well with some polymeride such as CR, SBR, EVA, PVC, Acrylic etc. 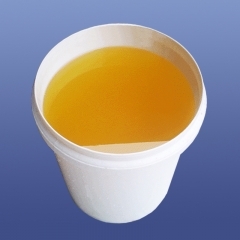 » Soluble in petroleum, aromatic, ester, ketone and other types of solvent. » Compatible well with some polymeride such as CR, SBR, EVA, PVC, Acrylic etc. » In the application of for pressure sensitive adhesive, has excellent performance at tackability and plasticity. » Depilatory & other body care products. Packed in plastic drum, 200kgs/drum, 20’FCL container can load 20MT (100 drums). The packing must be sealed well, can’t be stored and delivered together with acid, alkali and cationic substance, keep away from high temperature or under 0°C, and don’t put it in the sun. it is suggested that it would be better to be used with 3 months, the storage time can be lasted a little longer if store properly.